The ability to estimate the distance an airplane glides to a landing is the real basis of all power-off accuracy approaches and landings. This largely determines the amount of maneuvering that may be done from a given altitude. In addition to the ability to estimate distance, it requires the ability to maintain the proper glide while maneuvering the airplane. With experience and practice, altitudes up to approximately 1,000 feet can be estimated with fair accuracy; while above this level the accuracy in judgment of height above the ground decreases, since all features tend to merge. The best aid in perfecting the ability to judge height above this altitude is through the indications of the altimeter and associating them with the general appearance of the Earth. The judgment of altitude in feet, hundreds of feet, or thousands of feet is not as important as the ability to estimate gliding angle and its resultant distance. A pilot who knows the normal glide angle of the airplane can estimate with reasonable accuracy, the approximate spot along a given ground path at which the airplane lands, regardless of altitude. A pilot who also has the ability to accurately estimate altitude, can judge how much maneuvering is possible during the glide, which is important to the choice of landing areas in an actual emergency. The objective of a good final approach is to descend at an angle that permits the airplane to reach the desired landing area and at an airspeed that results in minimum floating just before touchdown. To accomplish this, it is essential that both the descent angle and the airspeed be accurately controlled. Unlike a normal approach when the power setting is variable, on a power-off approach the power is fixed at the idle setting. Pitch attitude is adjusted to control the airspeed. This also changes the glide or descent angle. By lowering the nose to keep the approach airspeed constant, the descent angle steepens. If the airspeed is too high, raise the nose, and when the airspeed is too low, lower the nose. If the pitch attitude is raised too high, the airplane settles rapidly due to a slow airspeed and insufficient lift. For this reason, never try to stretch a glide to reach the desired landing spot. Uniform approach patterns, such as the 90°, 180°, or 360° power-off approaches are described further in this category. Practice in these approaches provides a pilot with a basis on which to develop judgment in gliding distance and in planning an approach. The basic procedure in these approaches involves closing the throttle at a given altitude and gliding to a key position. This position, like the pattern itself, must not be allowed to become the primary objective; it is merely a convenient point in the air from which the pilot can judge whether the glide safely terminates at the desired spot. The selected key position should be one that is appropriate for the available altitude and the wind condition. From the key position, the pilot must constantly evaluate the situation. It must be emphasized that, although accurate spot touchdowns are important, safe and properly executed approaches and landings are vital. A pilot must never sacrifice a good approach or landing just to land on the desired spot. 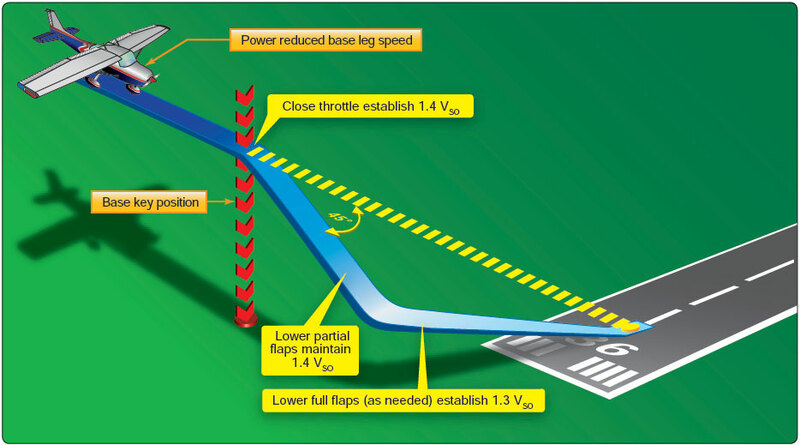 The 90° power-off approach is made from a base leg and requires only a 90° turn onto the final approach. The approach path may be varied by positioning the base leg closer to or farther out from the approach end of the runway according to wind conditions. [Figure 8-25] The glide from the key position on the base leg through the 90° turn to the final approach is the final part of all accuracy landing maneuvers. The 90° power-off approach usually begins from a rectangular pattern at approximately 1,000 feet above the ground or at normal traffic pattern altitude. 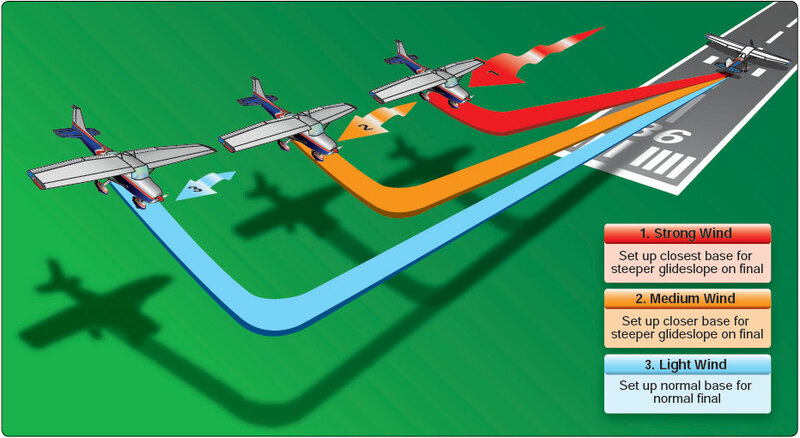 The airplane is flown on a downwind leg at the same distance from the landing surface as in a normal traffic pattern. The before landing checklist should be completed on the downwind leg, including extension of the landing gear if the airplane is equipped with retractable gear. After a medium-banked turn onto the base leg is completed, the throttle is retarded slightly and the airspeed allowed to decrease to the normal base-leg speed. [Figure 8-26] On the base leg, the airspeed, wind drift correction, and altitude are maintained while proceeding to the 45° key position. At this position, the intended landing spot appears to be on a 45° angle from the airplane’s nose. The pilot can determine the strength and direction of the wind from the amount of crab necessary to hold the desired ground track on the base leg. This helps in planning the turn onto the final approach and in lowering the correct number of flaps. At the 45° key position, the throttle is closed completely, the propeller control (if equipped) advanced to the full increase revolution per minute (rpm) position, and altitude maintained until the airspeed decreases to the manufacturer’s recommended glide speed. In the absence of a recommended speed, use 1.4 VSO. When this airspeed is attained, the nose is lowered to maintain the gliding speed and the controls trimmed. The base-to-final turn is planned and accomplished so that upon rolling out of the turn, the airplane is aligned with the runway centerline. When on final approach, the wing flaps are lowered and the pitch attitude adjusted, as necessary, to establish the proper descent angle and airspeed (1.3 VSO), then the controls trimmed. Slight adjustments in pitch attitude or flaps setting are used as necessary to control the glide angle and airspeed. However, never try to stretch the glide or retract the flaps to reach the desired landing spot. The final approach may be made with or without the use of slips. After the final-approach glide has been established, full attention is then given to making a good, safe landing rather than concentrating on the selected landing spot. The base-leg position and the flap setting already determined the probability of landing on the spot. In any event, it is better to execute a good landing 200 feet from the spot than to make a poor landing precisely on the spot.